A. L-R:MR.TONY AKIOTU GROUP MANAGING DIRECTOR OF DAARS COMMUNICATIONS PRESENTING SOME SOURVEIRS TO OTUNBA SEGUN RUNSEWE, DIRECTOR-GENERAL NCAC DURING A COURTESY TO THE MEDIA OUTFITS. The African Independent Television, a subsidiary of the DAAR Group, has promised live coverage for the forthcoming African Arts and Crafts Exhibition holding from August 27th to September 17th, 2017. 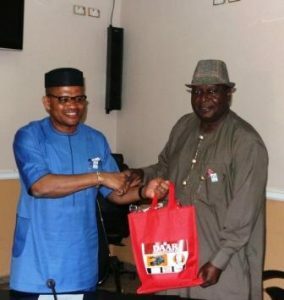 This was disclosed when the Director-General of the National Council of Arts and Culture, Otunba Segun Runsewe alongside a full retinue of his management team paid a courtesy visit to the management of DAAR Communications Plc in their office in Asokoro, Abuja. Speaking during the visit, Otunba Runsewe said the essence of the visit was to inform the DAAR Group about the forth coming AFAC which promises to host at least 25 countries and 150 exhibitors who are expected to showcase their unique cultural identities. He thanked AIT and DAAR Group for helping promote his past activities especially, noting that without media outfits like AIT, maximum publicity would have been difficult for him to achieve. Runsewe thanked the DAAR Group for making the Common Wealth Heads of Government Meeting (CHOGM) held in 2013 a huge success, saying that as the new culture boss in Nigeria, he remains committed to justifying his appointment by using culture as the only tool to change the narratives of Nigeria. He suggested that AIT should have a small media centre at the venue in Abuja in order to broadcast the event live to the world while passionately soliciting for the support of DAAR Communication in creating a mini documentary to project the phases of the expo including the preparation and the main event itself. He was positive that the efforts will get Nigerians to believe in our home-made products by buying made-in-Nigeria goods. Responding, the group managing director of DAAR group, Mr. Tony Akiotu said he has had a very good relationship with the NCAC boss spanning decades of fruitful journalism. He eulogized Runsewe for always discharging any assignment given him with dedication, passion and commitment noting that he was not known for mediocrity and half measures. He expressed his confidence that Otunba Runsewe will take culture to the next level giving his track record of success. Commending the DG’s ‘waste to wealth’ initiative, he highlighted the importance of media coverage in projecting important international engagements like AFAC averring that such subject should form major discourse on TV, Radio, Print and Social Media. He promised AIT’s unprecedented support for AFAC saying they will also partner in the creation of mini documentaries to promote the good work Runsewe has started which is expected to translate to a major boost in foreign exports of our local goods. In his traditional manner, Otunba Runsewe presented some locally made items like, branded tablet pouches, flower vases, mugs and foot mats all carefully designed from our local ‘Adire’ to project the waste to wealth hash tag trending at the moment.